We’re an established website design & development business serving Cathlamet, Washington. Graticle is your single source for website design and development since 2009. We specialize in web design for clients looking to take their existing website to the next level. We’re based in Longview, Washington. 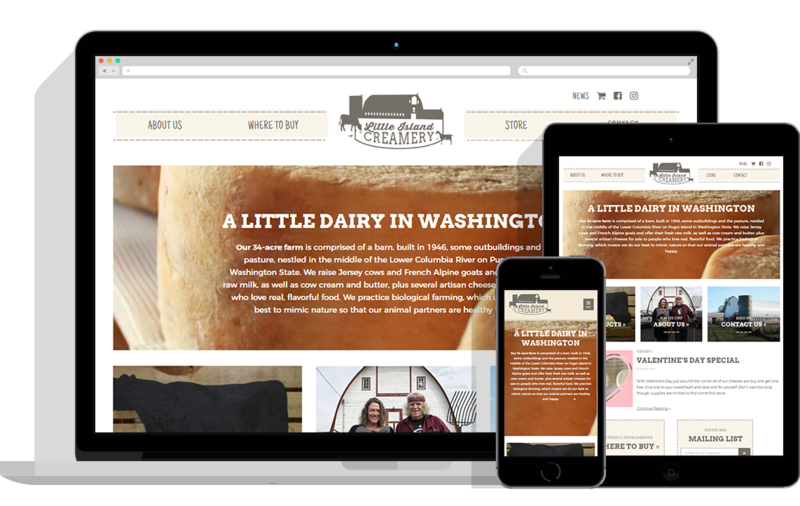 As a new dairy, Little Island Creamery contacted us to create a website where they could also sell their products. The first objective was to create a website that was easy to use for people to find out about Little Island Creamery. They also wanted to create an online store where they could sell their products, both perishable and non-perishable. For non-perishable items, those items needed to be shipped and tied into USPS's live shipping for accurate shipping quotes. For perishable items, those needed to be in-store pickup after payment. With these objectives (and more), we created a website for Little Island Creamery that hit all of the marks. They now have a very nice website for their customers to continue doing business with them online. I should also mention, Little Island Creamery is able to manage their website in-house with a customized dashboard for easy editing (along with training videos! ).